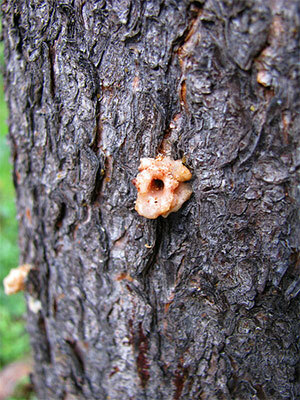 The Mountain Pine Beetle is a common pest that affects all species of pine trees in the Denver, CO area. A combination of sound cultural practices and preventative trunk spays are the best methods of controlling this pest. Donovan Arborists spray for the Mountain Pine Beetle in June to best protect the tree. One spray per season is needed to provide full seasonal protection. We can also inject pine trees with a treatment that lasts two years. This alternative method is option for those who may not want pesticides sprayed in the traditional manner or for trees that are hard to access with other spraying equipment. We use a closed system and pump the material directly into the vascular tissue of the tree. This application method is best performed in May. For those of you who reside in the foothills near Denver, trunk sprays and proper thinning of your property may be required to reduce the Mountain Pine Beetle pressure around your area. Removing infested, decaying and declining trees will provide the remaining trees with the space to grow stronger, bigger and healthier. We can help you develop a long-term management plan for your property and any services required, be it tree removal, appraisal, trimming and more. At the end of the day, healthy, disease and pest-free trees are beautiful features of your landscape and we love to be a part of that process. To learn more and speak with one of our certified arborists, call 303-623-8733 or send an online request.